In a bowl, mix the ingredients for the marinade with the chicken legs. Cover and marinade in the refrigerator for atleast 4 hours or overnight. Once marinading has been completed, in a seperate large bowl, combine the ingredients listed in the Flour Mixture section above to prepare the flour mixture which will be used to coat the chicken legs. Prepare the batter in a seperate bowl by breaking 3 eggs into the bowl and combining 3 tablespoons of milk. Beat until blended. Dip each chicken leg into the egg batter and then coat generously with the flour mixture. Shake of excess flour. Let’s proceed to double coating the chicken. Dip the coated chicken back into the egg batter and then coat generously with the flour mixture again. Shake off excess flour. Let’s move on to frying. In a frying pan, heat the oil on medium heat until the oil is hot. Place the chicken leg pieces into the oil one by one and leaving some space between each other. Turn and continue to cook the chicken legs until all sides are golden brown and the meat has been thoroughly cooked. 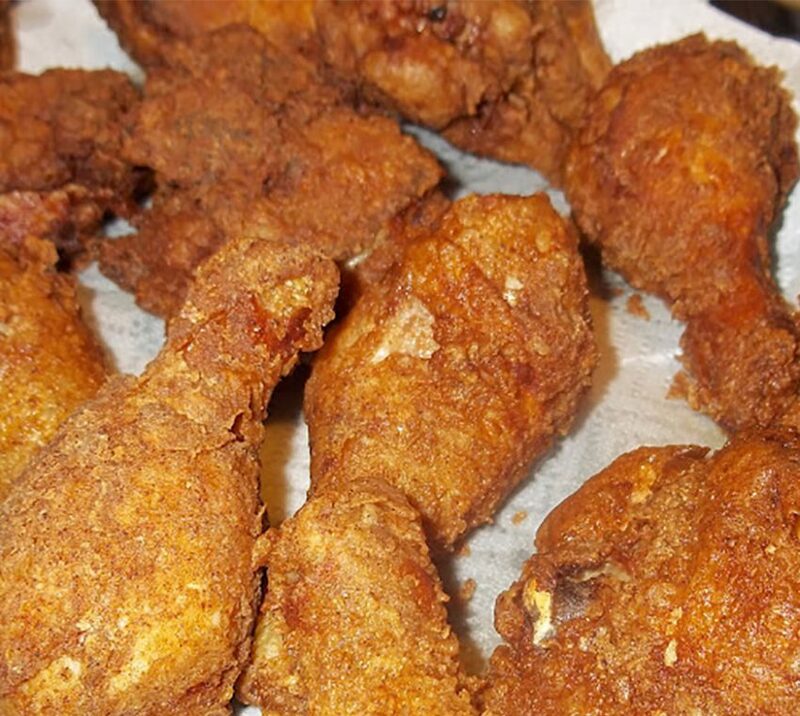 Once cooked, remove the chicken legs from the oil and place on a paper towel to allow excess oil to drain. That’s it! I hope you will enjoy this recipe. Let me know how it goes by sharing your comments.